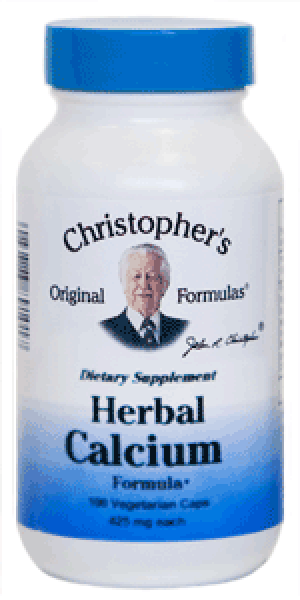 Dr. Christopher's Herbal Calcium formula aids the body with all calcium needs & is an overall wonderful all natural calcium supplement. A synergistic blend of herbs for calcium & other minerals. We need a good amount of calcium to keep our bones, teeth, muscles & blood stream healthy. Often we lack a lot of calcium in our diets today. Calcium is the most commonly found mineral in our bodies, yet many of us are not getting the proper amount we need to build strong bones, hair, teeth, skin, nails & healthy eyes. Dr. Christopher's Herbal Calcium formula aids the body with all calcium needs & is an overall wonderful all natural calcium supplement. Also available in Cut (Calc Tea), adult Extract, kid-e Extract (Kid-e-Calc) & Powder (Calc Tea) form. Herbal Calcium Formula is a wonderful all natural calcium formula. It is a synergistic blend of the following herbs: Horsetail Grass, Nettle Leaves, Oatstraw Herb & Lobelia. The bulk formula contains Horsetail Grass, Oatstraw Herb, Lobelia and Comfrey. As explained in the book, Biological Transmutations, the silica in horsetail grass converts to calcium. The other herbs work in close conjunction with this master calcium herb. We need calcium to build strong nerve sheaths, vein and artery walls, bones, teeth, etc. This combination is helpful for cramps, “Charlie horses,” successful pregnancies, healthy bones, teeth, hair, skin and nails, healthy eyes and for all calcium needs in the body. It is helpful for children as well as adults.